The researchers are using finite element modeling to evaluate the possible causes of World Trade Center Building 7’s collapse. 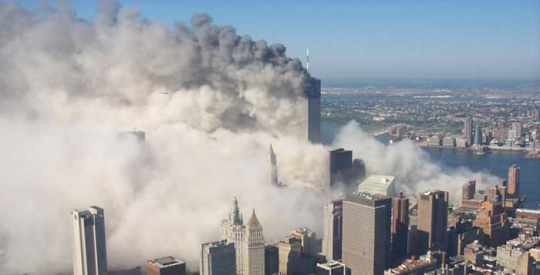 Although questions still remain about how the two planes that hit the Twin Towers could cause the total collapse of the high-rise buildings, many 9/11 researchers now focus on the mysterious collapse of building 7. A number of 9/11 family members point to the collapse of WTC7 as a possible crack in the official story that could spark a new national conversation on the events of that day. WTC7 was not hit by a plane that day; however, it collapsed at 5:20 p.m. according to the National Institute of Standards and Technology (NIST), the official cause for the collapse was office fires. A growing number of family members, activists, architects and engineers question the official theory for collapse and are seeking a new investigation into WTC7. Dr. Hulsey and the WTC7 Evaluation project hope to answer some of the remaining questions. The project is a two-year study that is being crowd-funded through Architects & Engineers for 9/11 Truth. Dr. Hulsey has invited professionals from the fields of structural engineering, civil engineering, mechanical engineering, architecture, building design and construction, physics, math, and science, as well as everyday citizens, to get involved. “Over the next year, with a team of PhD students, I will be rebuilding World Trade Center building 7, using the same drawings that were used to build it originally we will reconstruct it digitally,” said Dr. J. Leroy Hulsey. The researchers are promising a “completely open and transparent investigation into the cause of World Trade Center Building 7’s collapse,” and will post every step of their scientific process on WTC7Evaluation.org. The WTC7 Evaluation project will also include a review by a committee of technical experts who will vet the research being conducted by Dr. Hulsey and his students. The professor and his team are soliciting financial support from the public from now until the completion of the study in April 2017. Ted Walter, Director of Strategy and Development for A&E 9/11 Truth, is in charge of working with the professor and raising money to fund the WTC7 Evaluation. Walter told Activist Post that the project began in May 2015 and should should wrap up in April of next year. Walter said the goal is to get the report published in peer-reviewed engineering journals. “We hope to gain significant traction in the engineering community by providing an authoritative refutation of NIST’s report, by showing that there is no way that fires could have brought down building 7.” Walter also mentioned the possibility of getting the report into the hands of every member of Congress. As we approach the 15th anniversary of the September 11, 2001 attacks, it has never been more important to question and challenge the official government narrative. Exposing the lies and bringing the truth to light is going to take efforts by researchers like Dr. Hulsey, as well as architects, engineers, firefighters, pilots, government officials, and everyday citizens. Without a coordinated effort and campaign for truth, the American public will likely never know exactly what happened during that tragic day.